Woolly is a completely absorbing, intriguing, and controversial true story. Mezrich uses his ability to vividly dramatize nonfiction narratives (The Accidental Billionaires, Bringing Down The House) to weave together the stories of two brilliant scientists trying to save the world. A gifted geneticist works with a talented group of young scientists at Harvard's renowned genetics lab to splice the DNA from a frozen woolly mammoth into the DNA of a modern elephant to create a viable embryo. A hemisphere away, a world renowned and passionate conservationist has a scientific plan to save the permafrost from breaking down and releasing tons of methane by repopulating the tundra with giant herbivores. Of course it feels like Jurassic Park, but this is a real and ongoing current endeavor, with many fascinating ethical issues to ponder. The bestselling author of The Accidental Billionaires and The 37th Parallel tells the fascinating Jurassic Park­-like story of the genetic restoration of an extinct species—the woolly mammoth. 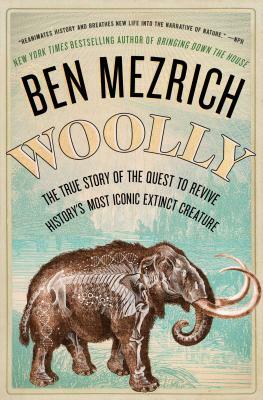 “Paced like a thriller…Woolly reanimates history and breathes new life into the narrative of nature” (NPR). With his “unparalleled” (Booklist, starred review) writing, Ben Mezrich takes us on an exhilarating and true adventure story from the icy terrain of Siberia to the cutting-edge genetic labs of Harvard University. A group of scientists work to make fantasy reality by splicing DNA from frozen woolly mammoth into the DNA of a modern elephant. Will they be able to turn the hybrid cells into a functional embryo and potentially bring the extinct creatures to our modern world? Along with this team of brilliant scientists, a millionaire plans to build the world’s first Pleistocene Park and populate a huge tract of the Siberian tundra with ancient herbivores as a hedge against an environmental ticking time bomb that is hidden deep within the permafrost. More than a story of genetics, this is a thriller illuminating the real-life race against global warming, of the incredible power of modern technology, of the brave fossil hunters who battle polar bears and extreme weather conditions, and the ethical quandary of cloning extinct animals. This “rollercoaster quest for the past and future” (Christian Science Monitor) asks us if we can right the wrongs of our ancestors who hunted the woolly mammoth to extinction and at what cost?